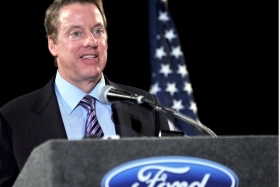 "You always go into the joint venture with the premise that you will save money and save manpower, and our experience often has been that it does neither," says Bill Ford Jr.
LAGUNA NIGUEL, California (Reuters) -- Ford Motor Co is open to partnerships in green car technology but will be cautious in committing to any alliance, Executive Chairman Bill Ford Jr. said. Ford is treading carefully on tie-ups after global rivals Renault, Nissan and Daimler announced a deal last week that will see them swap stakes and on electric cars, passenger cars and light commercial vehicles. "We are always open to it but I think we will be careful before we jump," Bill Ford said in an interview Monday on the sidelines of Fortune Brainstorm Green conference. "You always go into the joint venture with the premise that you will save money and save manpower, and our experience often has been that it does neither." Ford has reason to be wary. The No. 2 U.S. automaker just negotiated a sale of the Volvo brand to China's Geely for $1.8 billion after paying nearly $6.5 billion for the unit in 1999. Germany's Daimler AG also unwound its own money-losing merger with Chrysler in 2007 and took a loss of more than $30 billion on the transaction. Ford said partners heading into any alliance needed to have clear agreement on the division of work and the ownership of any intellectual property created by the partnership. "I am not saying every joint venture is bad," he said. "But you have to be very thoughtful and really have very clear expectations." Ford also has partnerships outside the auto industry, such as the one with Microsoft, which provides Ford with its Sync voice-recognition technology and has designed a software system to manage home recharging of electric cars. Ford said the automaker was pushing ahead with its electric vehicle strategy but was not yet convinced that battery-powered vehicles will be the dominant response to tougher fuel efficiency and emission standards. "It's too early to declare the winners and losers," he said. "Certainly, we are betting heavily on electrics." He also said the automaker could ramp up production of electric cars quickly if demand were to spike. Ford's electric vehicle strategy includes introducing a battery-powered version of its Transit Connect work van and an electric version of its Focus sedan next year. "We won't be a laggard with the technology," he said. "We are pushing hard on it. Who knows what the volume is." "We will be a leader if big numbers materialize but our whole (modus operandi) these days is not to overpromise on anything," he added. Ford, who was CEO of the automaker from 2000 to 2006, faced criticism during his tenure for pledging a sweeping rollout of hybrid vehicles that the automaker was unable to deliver. Now, he said, the auto industry is moving faster toward adoption of alternative fuel and renewable power technology, a trend he said could gain momentum if gasoline prices move higher in an "orderly" way. "I am really energized by the fact that we are really at the dawn on a new age in the auto industry," he added. "I have never been this energized by what I see happening to Ford and also to the industry."